We’ve been a partner with Valo for a couple months now, and we didn’t write a post about it here because we wanted to fully vet it first. We take great pride in delivering amazing, future proof solutions to our clients, and just because Valo was enough to impress us to partner with them, it’s not something that gets a free pass. So let’s take a look at why we, as seasoned intranet developers are so excited to tell you about Valo. 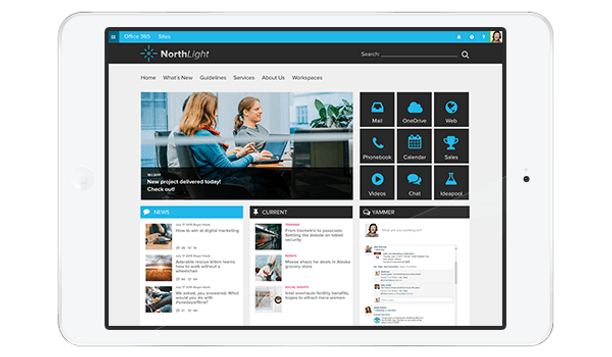 First of all, as intranet enthusiasts, it’s very important that the intranet provided utilizes 100% of the features that are there out of the box as much as possible. This has proven over and over for customers to be a key to the success of their projects. We must know enough about the tool we are building on to not recreate the wheel. 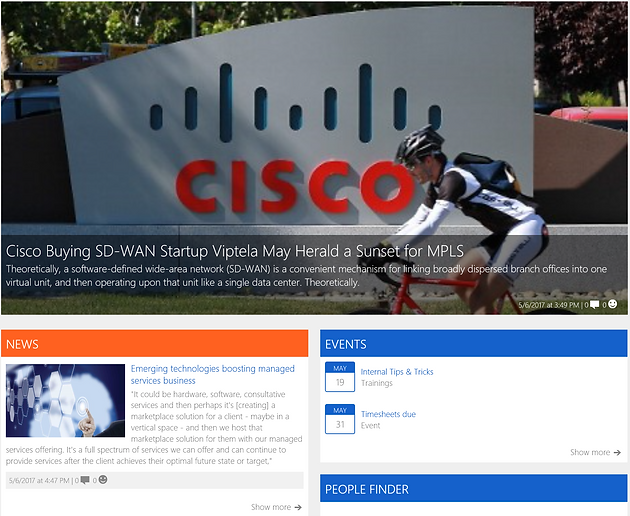 For instance, blogs and events are well handled in SharePoint. We don’t need a custom developed interface for capturing that type of data, we just need to be creative with displaying that data. Valo utilizes out of the box features for capturing data in as many places as possible, news and people are captured via blogs, and events are captured via calendars. This is a staple to how we have created intranets all along, no need for fancy pages with a ton of extra work for the users, blogs suffice in many situations! Where Valo provides a fantastic service, is displaying the content in different beautiful fashions. News can be shown in the slider, and in the news web part that allows a single article. You can see in the image below, the slider at the top, and the news at the bottom left. But also look at how great the events look. Now we all know that a great landing page isn’t all there is to an intranet. A side note, Valo provides 3 different variations currently with fourth on the way! Where Valo really shines, is the templates and responsive nature of the rest of the features. A great landing page is absolutely a key to driving adoption, but work happens for most employees outside of the landing page. Valo offers a great set of templates for departmental pages which we won’t go into, because they vary by each implementation so greatly. We will talk about how amazing the add-ons for Valo are though. Having experience with organizations of varying sizes, Valo really is the best intranet solution you can purchase, not only because of it’s features, but it’s pricing model too! Teamwork – This is where employees can get their work done, period! Valo took the words out of our mouth, when it comes to published intranet and work. Published intranet pages should be a resource for learning and resources. Workspaces/teamwork should be conducted in an almost separate intranet area. Still apart of the intranet, but not as managed as the published area. Work areas need to be agile, published intranet can follow company guidelines. Social Hub – If your company isn’t utilizing social media yet, you at least know it’s coming and you need to do better at it. The social hub allows for your employees to see what’s going on in the company by accessing all of the social networks in one amazing place. You can’t expect all of your employees to follow you on twitter, Facebook, Instagram, and linked in. But you can expect them to get the content you are publishing. So add the Social hub and up your social media game to show your employees how awesome your company really is! People Finder – Expertise, people, and departments are key to your organizations success. Before Valo’s deployments, we implemented this for every client. Valo provides an add-on that allows you to get these features quickly. Keep in mind, most people information comes from Active Directory, so it’s implementation is only as good as your backend. Idea Management – I don’t even know where to start here… this is last because it’s so great, I just want you to call me to discuss how amazing this can be for your business. I’ve partnered with companies before and they had that one feature that excited me so much, the passion just couldn’t be contained. Very much like when Microsoft released Delve. Idea Management is incredible, you can utilize true gamification and people’s ideas. This will be a game changer for companies that actually implement it and listen to their employees. If anything out of this post interests you, it should be this, If you want to see or hear my thoughts, a blog will be coming when I can correctly convey my thoughts. Or if you can’t wait, call me 702-305-2717!